The Walton County Water and Sewer Authority asked the U.S. Army Corps of Engineers to modify its permit for an intake facility on the Apalachee River after determining that not only its original site but three of its four alternatives are not feasible. Rights to the water that the Water and Sewer Authority wanted to withdraw from the original and the three alternate sites are protected under the Federal Energy Regulatory Commission permit for a power plant located on the river just upstream from the SR 186 bridge over the Apalachee River. The fourth alternate site, just downstream from the bridge, is not being pursued because it also is owned by the power plant operator. As a result of the rejection of its original site and four alternates, the Authority is asking the Corps to change its permit for the intake to specify a location on the Apalachee River in Morgan County about two miles south of the original site. The Authority wants to build the intake facility so it can convert the Hard Labor Creek Regional Reservoir in southeastern Walton County at some point in the future to a pump-storage facility by replenishing water in the reservoir with water from the Apalachee River. Walton and Oconee counties are partners on the Hard Labor Creek Regional Reservoir project, though the permit for the intake is held by the Walton County Water and Sewer Authority. The Corps has issued a Public Notice on the request by the Authority for modification of the permit to specify a new intake site and to extend the permit to Feb. 28, 2021, and is seeking public comment on the two requests. Deadline for comment is March 22. 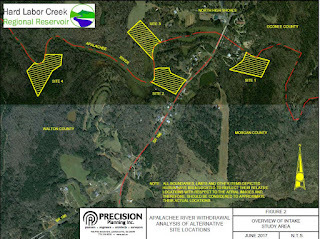 Jimmy Parker, project manager for the Hard Labor Creek Regional Reservoir and senior vice president with Precision Planning Inc. of Monroe, confirmed on Friday that the Water and Sewer Authority has a contract to purchase 202 acres owned by Robert Pennington Land and Timber IV LLC, based in Madison, for the intake facility. In an email, Parker said the current purchase agreement provides for a due diligence period of 150 days, and approximately 60 days currently remain in the contract period. “The Pennington tract was actively being marketed for sale during downstream site evaluations,” Parker wrote. The Authority first tried to purchase a 3.48-acre-tract between SR 186 and the Apalachee River in Walton County owned by Victoria Bracewell Presley. Presley is the daughter of Gaynor L. Bracewell, who built and operated the 1,027 kilowatt power plant. Bracewell passed way in 2006. According to records of the Federal Energy Regulatory Commission (FERC), the license is currently in the hands of Jason and Carol Victoria Presley and runs through Aug. 30, 2021. Jason and Carol Victoria Presley have filed a notice with FERC of Intent To File Subsequent License Application to extend the license beyond that date. FERC is an independent agency that licenses hydropower projects. Parker said that a legal review by the Water and Sewer Authority determined that the rights to water for the power plant are protected by the FERC permit held by the Presleys and the Federal Power Act, which extended FERC authority. “In essence, any water withdrawal within the FERC project boundaries would require the approval of the permittee and FERC as a ‘non-project use’,” Parker said in his email. 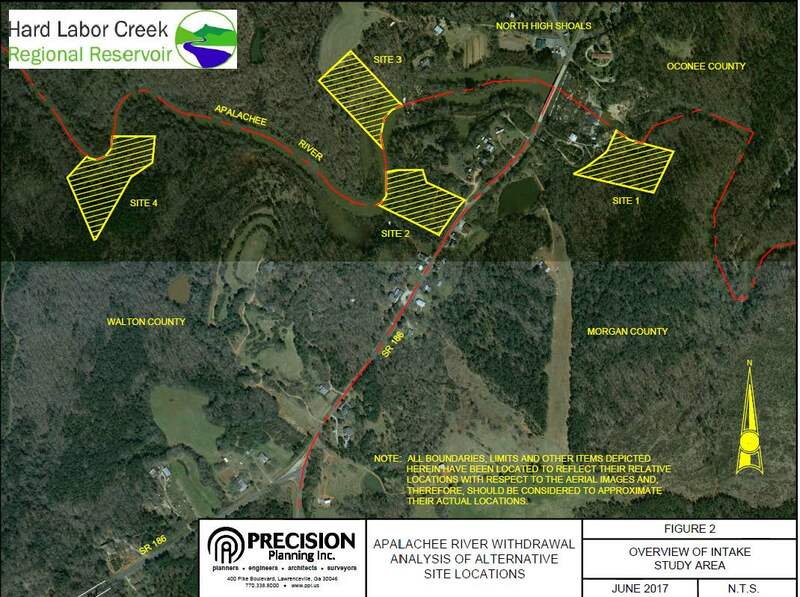 The FERC project boundaries covered the original property owned by Presley and each of three upstream alternate sites, Parker said. The restrictions extend 3,000 linear feet upstream from the upper dam, which is at the power plant, Parker said, or a little more than a half mile. Because the sole alternate downstream site was part of the power plant property, the Authority sought alternative sites below the power plant, Parker said. Jim Sunta, senior process Engineer with Precision Planning, sent Corps of Engineers a memo dated June 9, 2017, analyzing each of the four alternate sites that had been identified at that time. The first alternate was the property downstream from the SR 186 bridge in Morgan County. The second alternate was in Walton County upstream from the dam. The third alternate was in Oconee County, also upstream from the dam. The fourth alternate was in Walton County and further upstream from the dam. Sunta told the Corps that analysis of the sites showed that the second alternate was the best, followed by the fourth alternate. Both of these are in Walton County. The Oconee County and Morgan County alternates were excluded for further consideration, Sunta told the Corps, because of their negative evaluations. Note: This post was updated at 11:06 a.m. on March 19 to include the specification of the distance upstream from the dam covered by the FERC restrictions. Parker provided me that information in an email at 10:38 a.m. on that date.